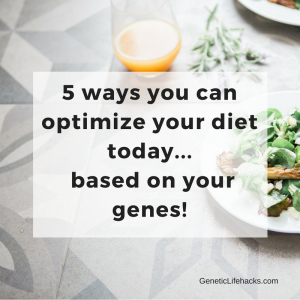 Learning about genetics has given me a new perspective on so many different subjects. For example, seeing first-hand how much of a difference the right vitamins and minerals make in a person’s mood due to changes in their neurotransmitter balance has made me much more understanding. Cut me off in traffic? Instead of just assuming you are a jerk, I now wonder if you were driving aggressively due to needing a little lithium orotate along with the right type of B12. So now I have to once again change my perspective. Over half the population can’t smell a compound in floral fragrance nearly as well as I can. Instead of being irritated at that lady wearing too much floral fragrance, now I recognize that she probably thinks it is lightly pleasant — I’m the one that is different. And now I wonder what it is that I’m not able to smell! 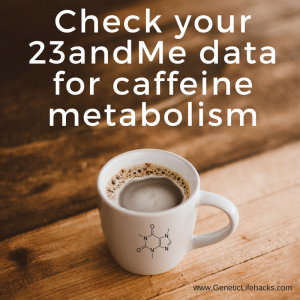 So what kind of interesting things can we learn from 23andMe data about what/how we smell odors? Asparagus pee smell…. was something that I assumed everyone smelled. Turns out that more than half of people in a study of nearly 7000 were unable to smell asparagus pee. A second study looked into whether it was a lack of ability to smell the odor vs. a lack of producing the odor. The study found that 8% of participant’s urine did not have a detectable asparagus odor and also that the ability to smell the asparagus pee smell is much stronger in those who carry the A allele of rs4481887. Being able to smell or not smell certain odors has been linked to food preference and a risk of obesity. For OR7G3, those carrying the C allele variant had almost a whole point higher BMI on average. Beyond just smelling the flowers…. While this has been a rather light look at being able to smell different odors, there are more serious issues for people with anosmia (inability to smell) and I encourage you to dig deeper into the topic if you have an inability to smell. It seems that the research into odorant receptors is just in its infancy with quite a bit of new information coming out in the past couple of years. We actually have these odorant receptors other places than just in our nose, leading to the idea that they play other roles in the body. 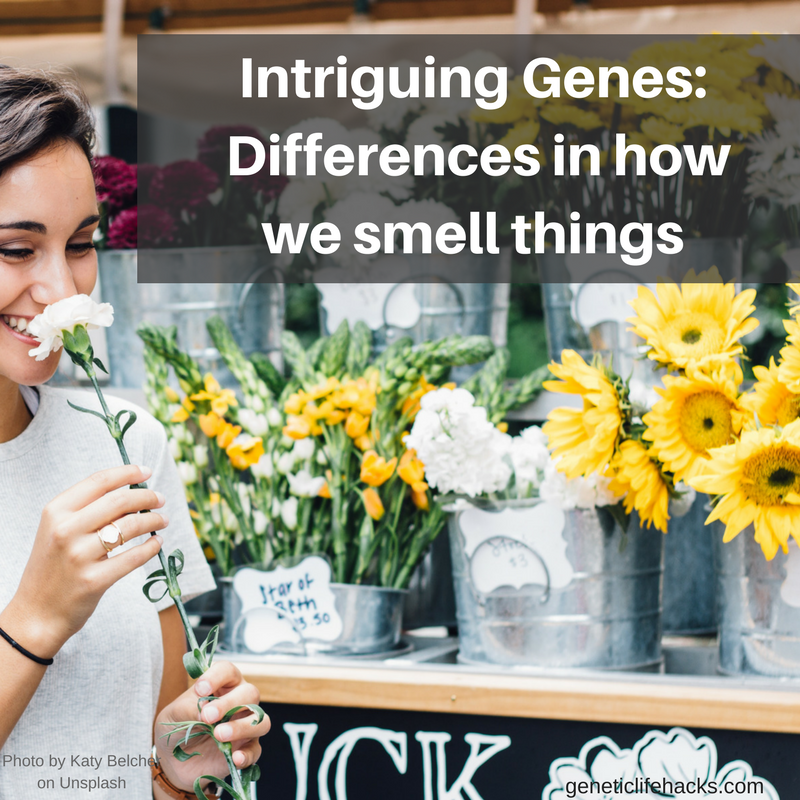 HLA typing is also linked to olfactory gene variants. A recent study looked at using smell tests as a way of determining HLA variants. One last tidbit for your olfactory knowledge base is that some molecules are transformed in the mucus before reaching the odor receptors. CYP1A2 genetic variants (check yours here) were found to play a role in the conversion of acetophenone (cherry, almond chicory smell) to methyl salicylate (wintergreen smell) in the nose. [study] So the whole kit-n-kaboodle gets a little more complicated. Olfactory Receptors in Non-Chemosensory Organs: The Nervous System in Health and Disease – a review of studies looking at olfactory perception in neurodegenerative diseases such as Alzheimer’s, Parkinson’s, and Creutzfeldt-Jakob disease. Disruptive physiology: olfaction and the microbiome-gut-brain axis.